As we all know, Soccer requires a great deal of teamwork. Players of the game must be coordinated and cooperative if they desire to success on the field. Apart from teamwork, soccer teaches that the only sure path to success is through hard work, setting feasible goals and having Perseverance. 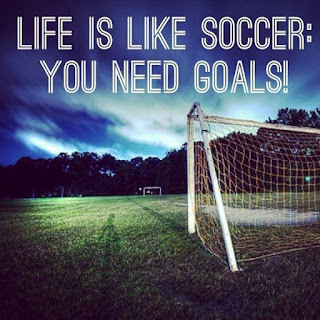 In the first part of this article, (click here in-case you missed it), we talked on some similarities between Soccer and Life. Continue after the cut.. So, What does Soccer has to teach us about life? Football managers in the EPL and other leagues in the world often have a fixed number or amount of points they set for their team. For sure you would have heard some managers in the EPL murmuring that "once their team gets 40points, they are sure of survival" i.e not being relegated. So also in life, we should have a feasible plan or goal that is achievable. Every year you see some teams involved in a relegation dog-fight. They start putting more efforts into matches. In-fact, some of those battling with relegation to the lower league play so good that they even take points from those teams in the higher half of the log table. Assuming these teams had a good start to the league, put in more vigour, more efforts to their game of course they won't be involved in their struggles with relegation. Likewise in life, we see some people who wait until the last second before they start putting in efforts. Some won't read until its two or three days to their exams, won't work on their business plan(s) until they are to face panel of judges. Don't ever let your survival tactics, business plans go down the wire before you start working on them. Early planning goes down a long way in helping you achieve success . Chelsea football club, winners of the Barclays Premier league for this season actually deserve to win the Barclays English Premier league. They were not only the team with the most wins but they were the most consistent. Though at times, they were accused of packing the bus 🚌 and playing boring games. But to be honest, they had an aim which was to get their desired results. Though they suffered upsets at some moments, they picked themselves up and continued getting results. Few would remember their loss to Tottenham Hotspur football club at the turn of the year but they moved on from the defeat. For a team who spent the most time at the summit its no mean team to feat to win the premier league despite the set backs . And the main lessons from them is that, at times its not how you play the game that matters but how you get the right or desired results. Alli Shamsudeen Ayobami is a student of the University of Ibadan. He is a Member of the press organisation on campus. Alli loves watching Soccer and his favorite team is Arsenal FC of North London. You can contact Alli on [email protected]_icestorm or whatsapp on +2348175259644.